I saw this cold shoulder top from SheIn on Gina from On the Daily Express a while ago and loved how it looked on her (original post here). So, at only $16, of course I went ahead and ordered it! Gina wore it with distressed jeans for an early spring look, but I wanted to try it with white jeans and turquoise accessories to make it feel more summery. While I love this top, it might be one that gets packed away until next spring. The top looks much better tucked in so it gives the blouse some fit instead of being so loose and blousy. And unfortunately you can't really tuck anything into maternity pants! But I will gladly wait until next spring because this top is so cute! I love this lighter colors on you, Laura! You look amazing. And that bag is stunning! I adore the color! Really great look for summer and beating the heat while pregnant! I love this fresh top, super cute with the white denim for summer! Beautiful cold shoulder babe! I was just saying on my blog how I do not think I look good in cold shoulder! Man, you look darling in it, super cute summer outfit!! What a lovely top! I adore the ots detail combined with a button down. So chic! Thanks for the link up! Another winner Laura, you look fantastic! Hard to believe that top was so inexpensive! Your hair looks terrific too! I hope you're enjoying your Summer! That top is so cute! Love the turquoise accessories! Such a fresh, summery look! I think it looks great untucked in this outfit, Laura!! The color combo is one of my faves for summer--it's so fresh and pretty!! Oh yay!! I'm so glad you got this top! It looks great on you! I have been meaning to try it with white jeans (or shorts depending on the weather) next, so I'm glad to see it looks like a great combo! This cold shouldered top is adorable! I love how it is a button down! I think I would have def. paired it with white jeans, too! Now I'm curious how Gina styled it! It is a cute top! I especially love the button style. I love this blue and green together! What a perfect summer combo! Don't you love it when you find something you've been wanting on sale like that! I love that top too, its a great summer piece! Peace! Is there anything more classic than a blue and white look for Summer? Love this look, your cold shoulder top is beautiful and the price is totally right! 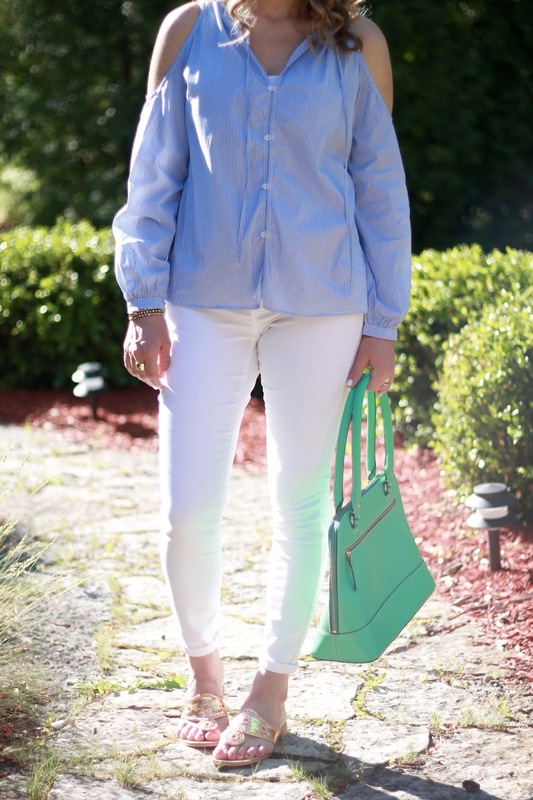 I love the nice relaxed feel of the blouse and your mint bag is gorgeous! Ohhh I quite like that top especially untucked as a tunic with the white jeans. Because light blue + white = Summer. That bag is stunning Laura. Loving your pregnancy style so far. I love your top, so cute, cold shoulder is my fav! The green bag is a great contrast, have a great day! Love the crisp white jeans with the pretty OTS top! Those sandals look so cute and comfy too! I love this top! It looks great with the white jeans and turquoise accessories! I love the cold shoulder look. 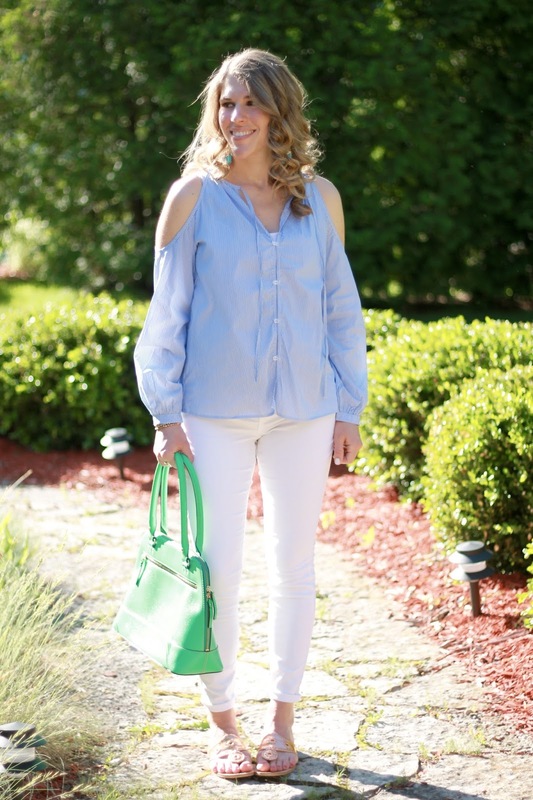 I am always down for white jeans come summertime, and more often than not I like to pair it with blue like you! Love this cute top! It looks great with your white jeans and sandals. Old Navy's maternity pants were my favorite when I was pregnant! I love your top too! Such a cute top! You look great! You look great! I love this take on the cold shoulder! LOVE the blouse! Love the casual vibe to it and I agree, I think it looks chic tucked in too. Love that pop of color too with the bag, adorable. You are glowing! I love the cold shoulder and this one is just adorable! I love the cold shoulder detail! You look incredible! Laura, you look amazing. How is it you look so poised and chic amidst this sweltering beast called Summer? Such a unique top. 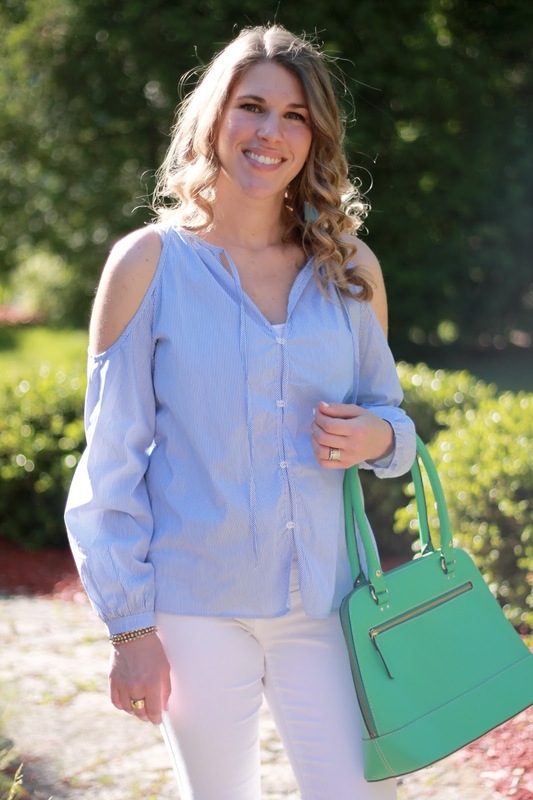 I've never seen a Cole shoulder peasant blouse and I love it! Such a cute top! It goes perfect with your white jeans! Such a great combo. Light and airy with the blue and white and the pop of green is great! Adorable top, Laura! I get what you're saying about wanting to tuck it in but even left out you wear it beautifully! Looks so pretty with the white denim and turquoise bag! You and Gina both rock this blouse! I love blue and white together, obviously LOL. So many of my outfits are this color combination. Gina always looks so great, and I love it on you too. White and blue will always be one of my favorite combos. You look great in all pastels! Thanks for linking up to Top of the World Style. Pretty top, it looks very cool and comfortable. I love the colour of your bag! This look is so fresh and Springy! I love the stripes and white jeans together!